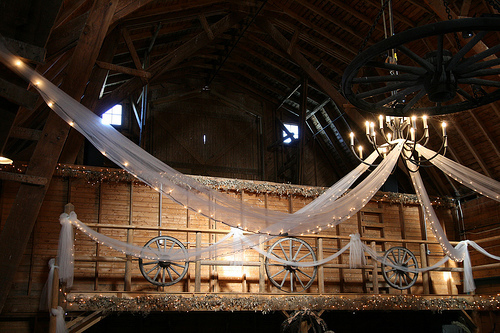 Country weddings with all of their rustic charm and beautiful details are really popular. And with everything that is popular when it comes to weddings there is often a big price tag. However it doesn't have to be that way, here are my top tips to keep to your budget. The biggest cost is going to be your venue, so you need to find a great venue without it costing you a fortune. 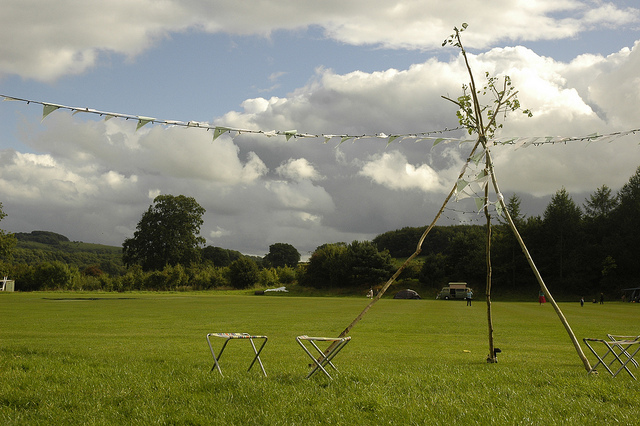 The easiest venue in the country is a field, park or big open public space. 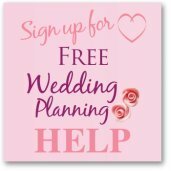 If the weather is not going to be guaranteed then you may want to look at renting a cheap wedding tent to keep your guests dry. Or if the weather is going to be ok then you could have a BBQ or a picnic with everyone sitting on blankets and rugs. 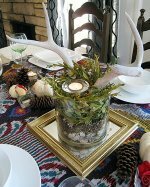 You could get your guests to bring their own or buy them from Goodwill for a rustic charm. Other seating ideas could be bales of hay but these can be expensive and are heavy to move. 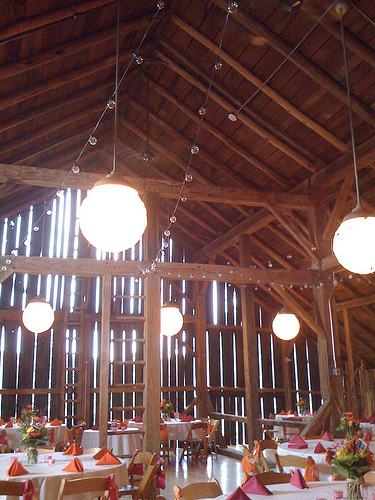 If you are looking to have a barn wedding on a budget then you need to have a look around for barns that are not usually used for weddings. This way they won't cost as much. Speak to local farmers and ranches if they have the space. Another idea is to look out for Country museums as they quite often have the space and would be happy with the extra money. 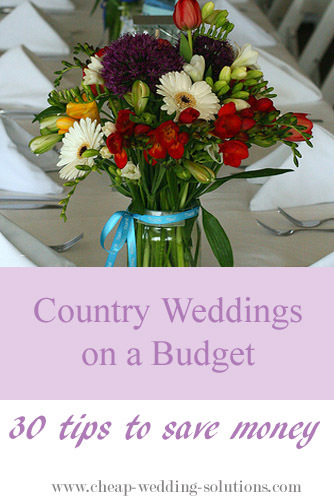 Check out these cheap wedding venue ideas too. The great thing about having a country wedding is that you are in a beautiful location which will look great in your photos and will also need very little in the way of decorations. However, there are lots of inexpensive decoration ideas that will make your reception look even more beautiful. 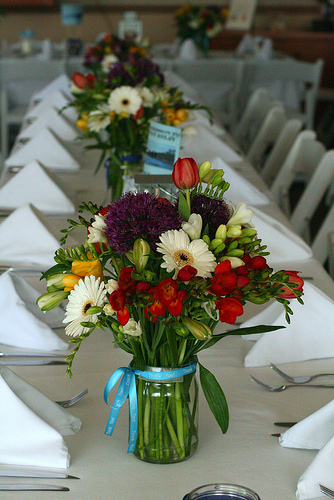 Jars make great vases for your wedding tables. Burlap table runners are cheap and they look great. And candles and fairy lights make anywhere look magical and fabulous. Plus big sways of white tulle look beautiful and are cheap for the amount of area that they can cover. Slices of wood also make great table decorations. As well as having an amazing venue you will also want to look amazing too. 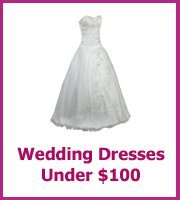 These wedding dresses would look fantastic at a country wedding and the prices are brilliant.